Available at militaryarchives.ie, the documents are opening a new window on the 1916 to 1923 period in Irish history. Many of the prominent leaders of the independence movement describe their activities in great detail in their pension applications but the real treasures in the collection are the stories of ordinary volunteers and civilians caught up in the tide of history. It will take years for historians and researchers to mine the 300,000 files contained in the archive. They include all of the 82,000 pension applications even though only 15,700 of them were successful. The first launch comprises approximately 452,000 images relating to almost 3,000 individuals. As well as providing information about themselves, the applicants also give fascinating details about the events in which they participated and the role played by others be them fellow volunteers, civilians, policemen or soldiers. The first batch of files released today covers those who were involved in the 1916 Rising. Most of them continued their involvement in the national movement until 1923, so their account of what happened during the whole period is also included. Many leading Fianna Fail politicians including Sean Lemass, Sean MacEntee, Frank Aiken, Oscar Traynor and Thomas Derrig were awarded pensions. The often overlooked activity in north Dublin, Wexford and Galway is also outlined in the first batch of files. Richard Mulcahy, later chief-of-staff of the IRA and a prominent political figure for decades, detailed his service beginning with the attack on the RIC in Ashbourne, Co Meath, in 1916. Another volunteer who qualified for the maximum pension was Peter Paul Galligan from Enniscorthy who was on the staff of Thomas MacDonagh and was sent to his home town to promote the Rising there. Leading figures involved in the IRA campaign in the War of Independence, such as Tom Barry and Dan Breen, qualified for full pensions. Barry engaged in a furious correspondence with the Department of Defence when he was not given the maximum pension as the rules specified that 1916 service was required. Barry was in the British Army in 1916 and so did not qualify for the full pension but the then Taoiseach Eamon de Valera intervened to ensure that he got it. Many of claims outline the difficult personal and financial straits to which people had been reduced by the 1920s or 1930s. A good number of those who took part in the campaign were forced to emigrate. Claims came in from all over the world but ironically most of those who left went to live in England whose forces they had fought against at home. A letter from one 1916 veteran, Thomas Lynch, who was living in Birmingham in 1936, stated: “I am sorry the years are not dealing kindly with me. I have done no work for 5 years.” He had run out of all benefits had a wife and four children. The eldest had just started work at 14. Some of those wounded or injured in the hostilities gave accounts of the straitened circumstances to which they had been reduced and the trauma they had endured. However, some found the experience of taking part in the military campaign invigorating. Some of the claims illustrate the complexity of Irish history. Patrick Dalton and Michael McCabe took part in the 1916 Rising as 16-year-olds, were captured but released early on account of their age. They subsequently joined the British Army and fought in the first World War but later took part in the Civil War - Dalton in favour of the Treaty and McCabe against it. 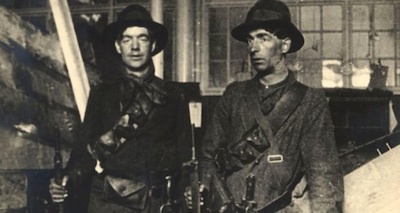 McCabe, who was part of the Four Courts garrison was captured by the Free State Army and interned. On his release in 1923 he rejoined the British Army and saw service in North Africa during the second World War. Claims from volunteers who served in Scotland and England during the period are also included in the files. One of them, John King, joined the Liverpool unit of the Volunteers in early 1914 and he travelled to Dublin in January 1916 to take part in the Rising. He served in the GPO and was wounded in the retreat to Moore Street. Another overseas volunteer was Eamonn Bulfin, who spent his youth in Argentina. He served in the GPO and was deported to Argentina in 1919. While there he acted as the Dail envoy to that country until 1922 when he returned to Ireland. His father William Bulfin had edited the Southern Cross newspaper which catered for Irish emigrants to Argentina. The claims and the supporting documents in the first release of files are available on line from today at militaryarchives.ie. The full release of all the documents in the archive will take place between now and the anniversary of the Rising in a little over two years’ time.